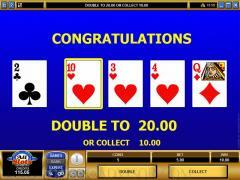 Jacks or Better Poker is a rather standard, straightforward poker variation that is designed by Microgaming, the "head honcho" in terms of online gaming software in the world. It is simple enough that anyone can play it, as it pays off on a pair only if that pair is jacks or better, and otherwise resembles any standard version of the game. There are no wild cards, no jokers, no bonus payouts that are out of the ordinary. 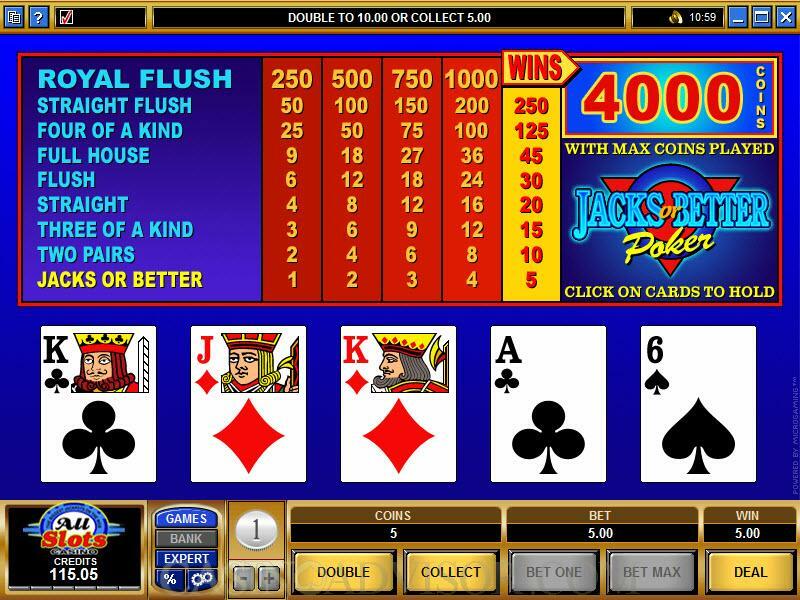 The maximum jackpot that is paid out in Jacks or Better Poker is 4000 coins, which comes as a result of a Royal Flush (10, J, Q, K and Ace of the same suit). 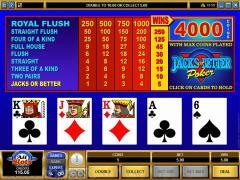 Jacks or Better Video Poker is played with a standard deck of 52 cards, with no wild cards. The cards are shuffled before each and every deal, and so they come out randomly. The wagering process invokes the use of the plus (+) and minus (-) controls, which will increase or decrease the size of the coins you will use in your betting. When you click "Bet One" you are betting one unit times the coin size, Clicking "Bet Max" gives you the maximum times that coin size. For example, if your coin size is 0.25, the maximum bet you'll have is 1.25. If it's 5 units, the max bet will be 25. Everything is pretty much under your control. When it comes to beginning play, you click "Deal" to get the cards. Now here's where you can go one of two ways. You can choose to do the process automatically, which comes through AutoPlay, which will make your decisions for you according to a mathematically-sound strategy and stop whenever you want (e.g., after jackpot is own, after exceeding pre-set win figures, after any win, etc.). Or, you can just play all the hands yourself manually. We should add that even though this is a rather standard version of the game, there is indeed a little "twist" that can be played. After a winning hand, the player can seek to double that win by engaging in a "showdown" with the dealer. There are five cards dealt onto the screen - four of them face-down, which represents a choice for the player, and one card face-up, which is the dealer's card. The player picks one of the face-down cards and if it is of a higher value than the dealer's face-down card, the win is doubled. 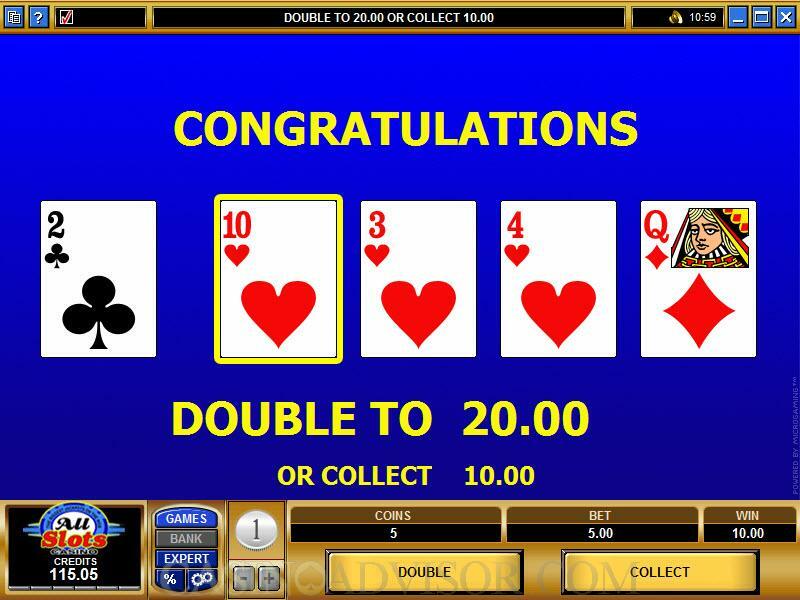 The player can elect to double again, or quit and collect. Interested in reading more detailed information about Jacks or Better Video Poker? If so Click Here for more details.